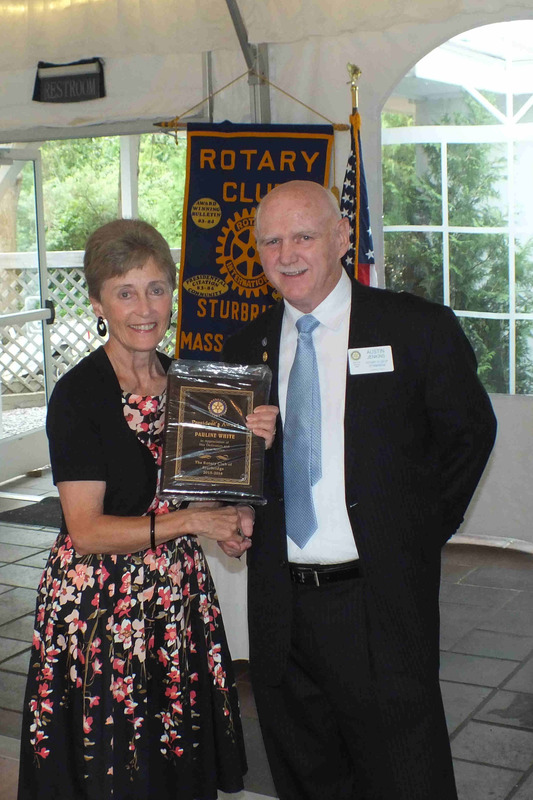 Kelli Robbins of Holland, MA was welcomed to Rotary recently. 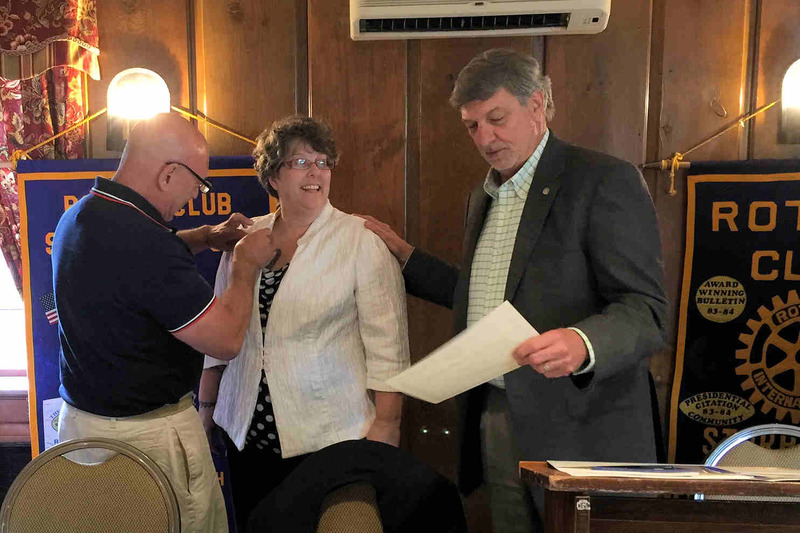 She is an attorney and serves as the Executive Secretary to the Town of Holland. In her free time she enjoys reading and training seeing-eye dogs. 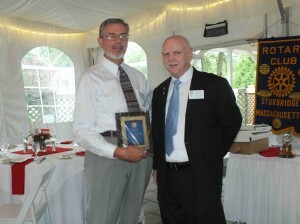 Assisting with the induction ceremony are Past-President Larry Mandell who is Kelli’s sponsor and PDG Carl Kaliszewski. PP Larry affixing Kelli’s pin and PDG Carl. 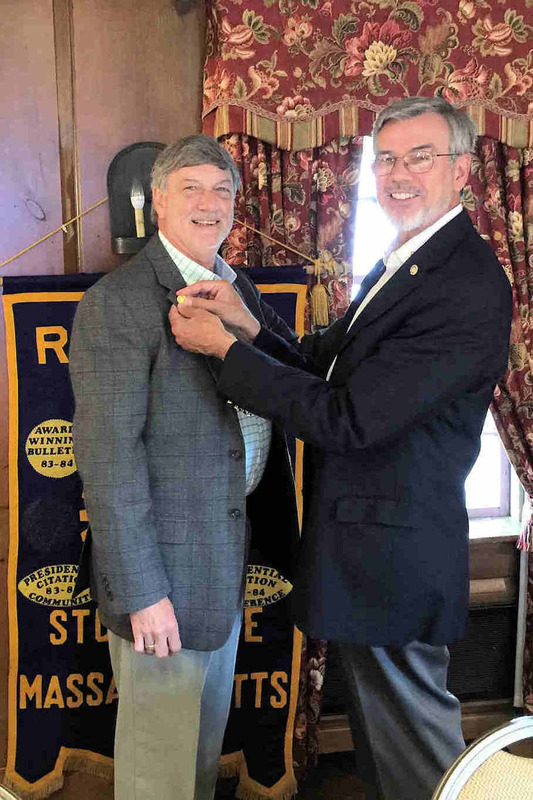 The Club was proud to present Carl Kaliszewski with a Rotary Foundation Paul Harris Fellow pin +7 which means Carl has earned this designation a total of eight times. 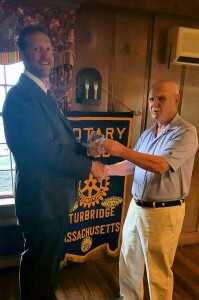 Carl joined Rotary in 1993, served as President of the Webster/Dudley Club in 1996-97 and again in 2009-10 after his transfer to the Sturbridge Club. 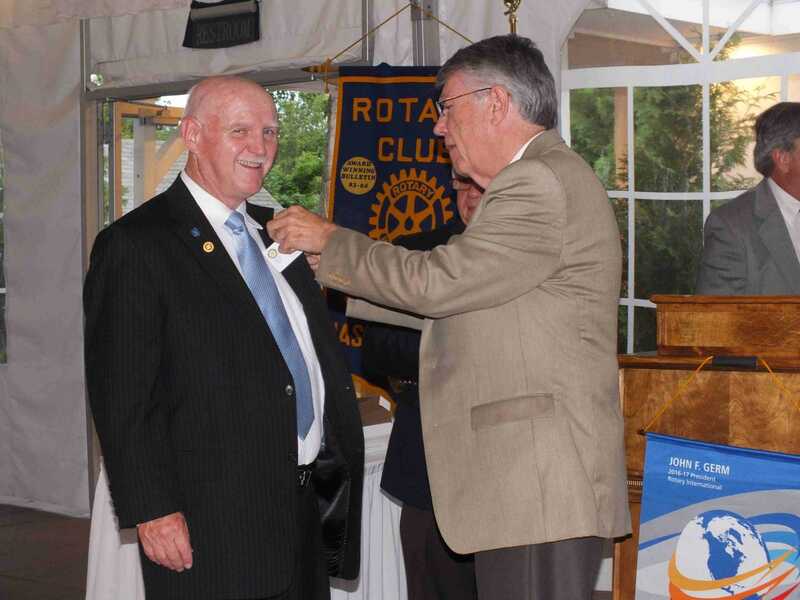 He also served as District Governor in 2004-05. 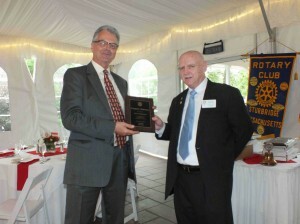 Congratulations Carl for all your service to Rotary. 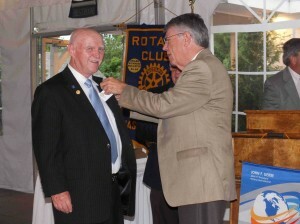 Presenting Carl with his PHF pin is PDG Klaus Hachfeld. 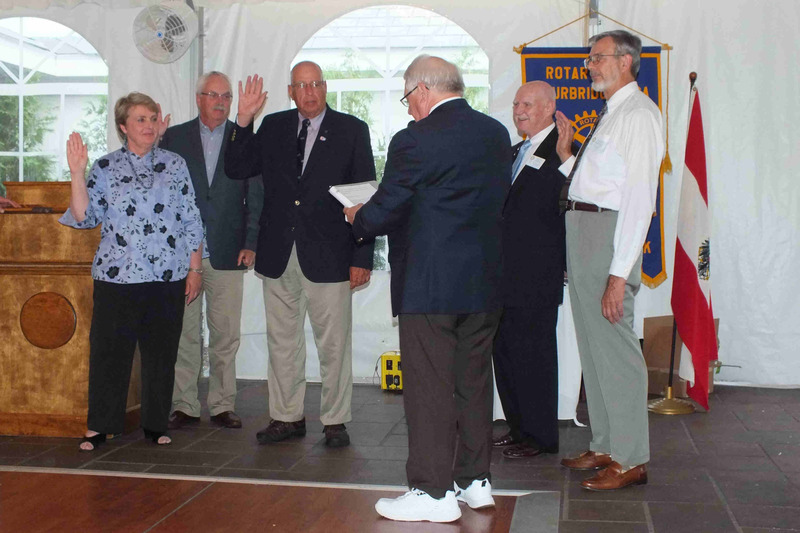 The Installation of Officers for the new year took place in the wedding tent at the Publick House on a warm, beautiful evening. 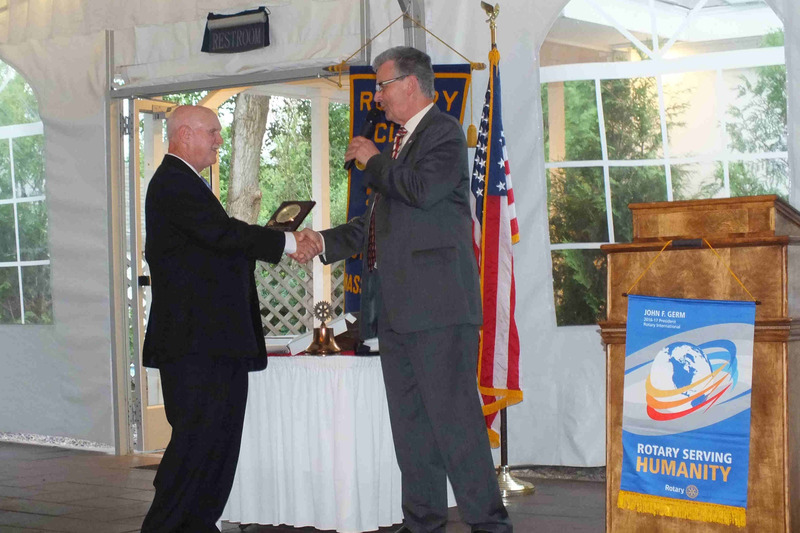 District Governor Jim Fusco officiated at the event. The evening began with Austin’s review of his year. He then presented awards to those who went above and beyond to demonstrate the Rotary motto of ‘Service Above Self’. 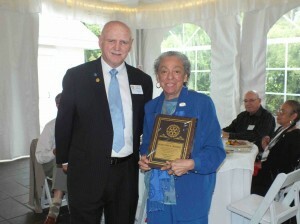 Dorothy for her work with Youth. 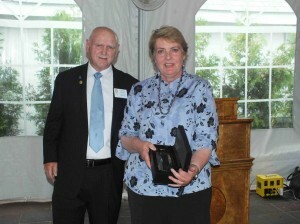 Lorraine for her dedication and her many years as treasurer of the Club. 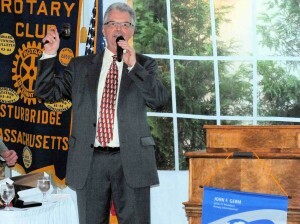 Ken as Secretary of the Club. 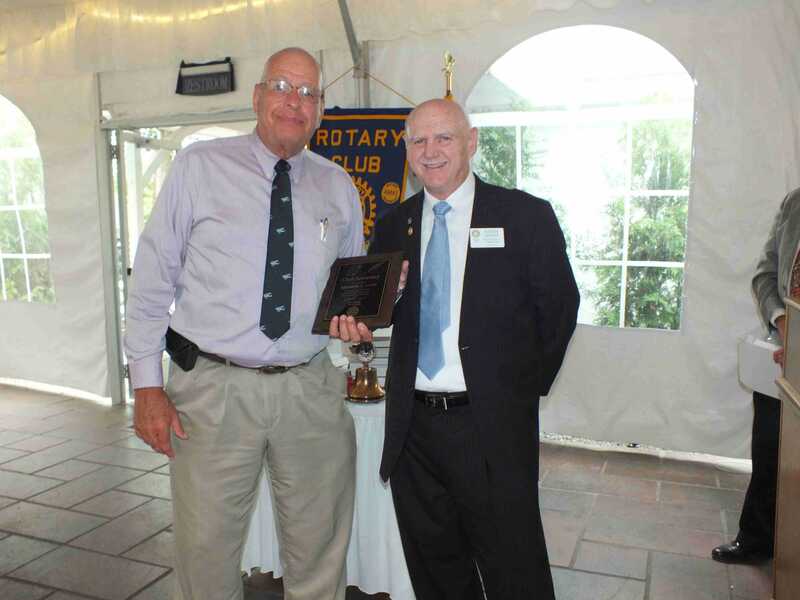 Bob K. – A Service and Dedication Award. Klaus – The Always There Award for handling all matters large or small. Otto for his untiring efforts to provide excellent speakers consistently. 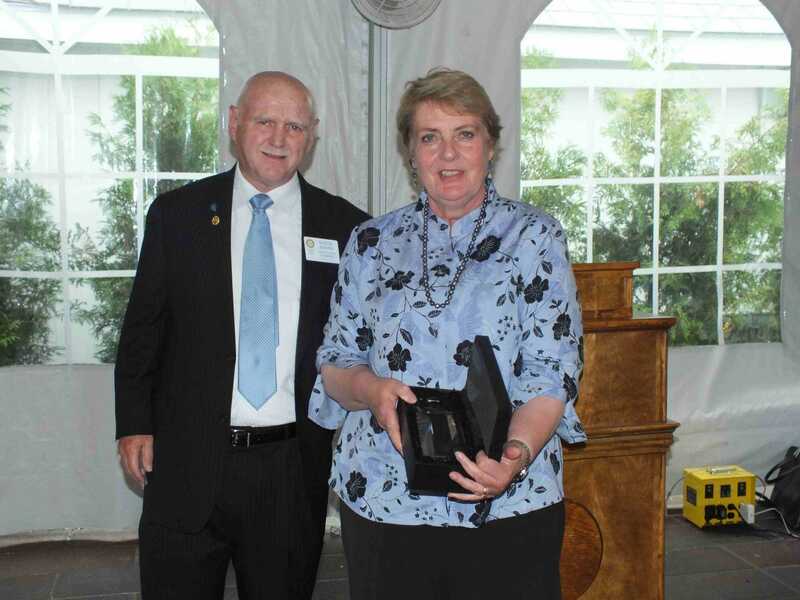 Pauline – The Presidents Award for writing the 44-year history of the Club, Club publicity, website News Blog and Facebook. 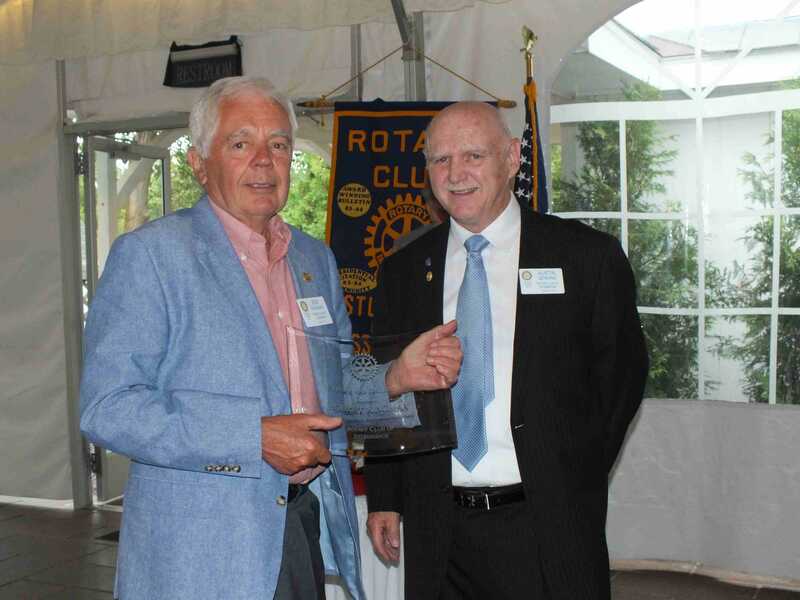 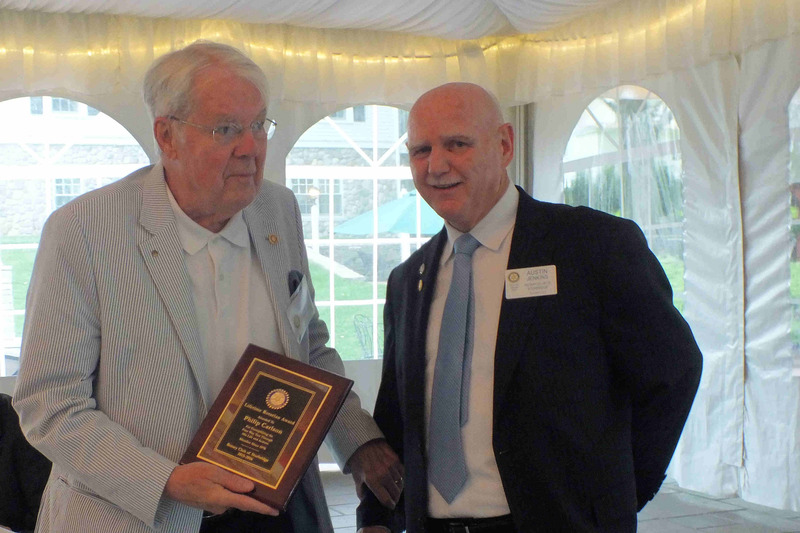 Phil – the Lifetime Rotarian Award for his many years on the Scholarship Committee and his continuous Club Service. A Paul Harris Fellowship was bestowed on Honorary Rotarian Astri Carlson by her husband Phil. A proud moment! 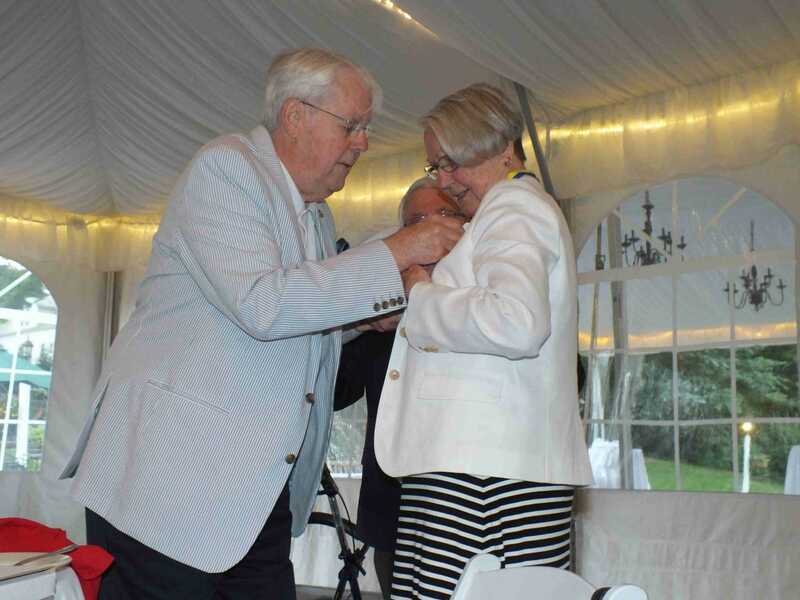 A Paul Harris Fellowship for Astri Carlson. 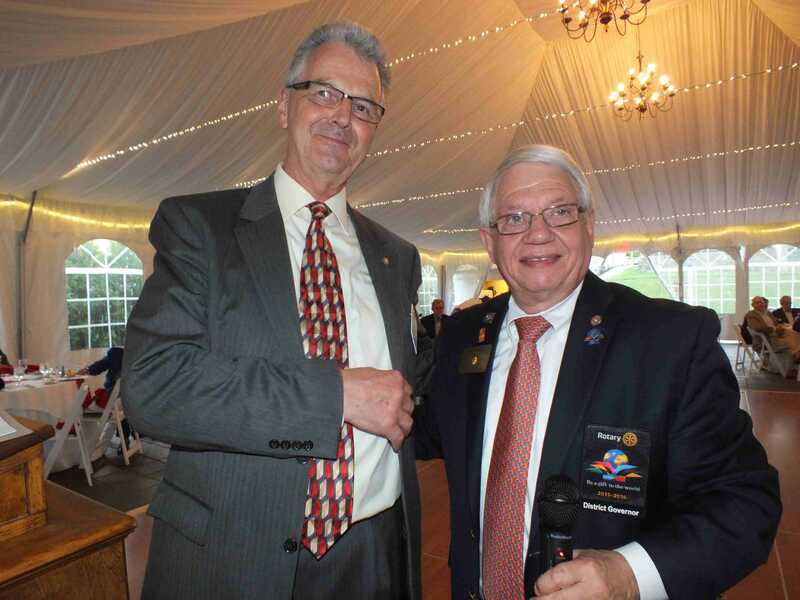 New President Otto Prohaska (on left) with DG Jim Fusco. Swearing in of Club Officers. Assistant DG Cliff Gerber pins Austin with the Past President’s pin. PP Austin was presented with a clock for his service as President. 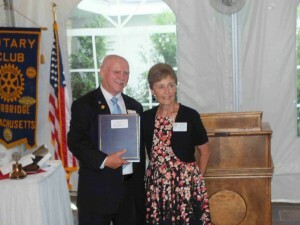 Pauline presents PP Austin with the President’s Book for his year. 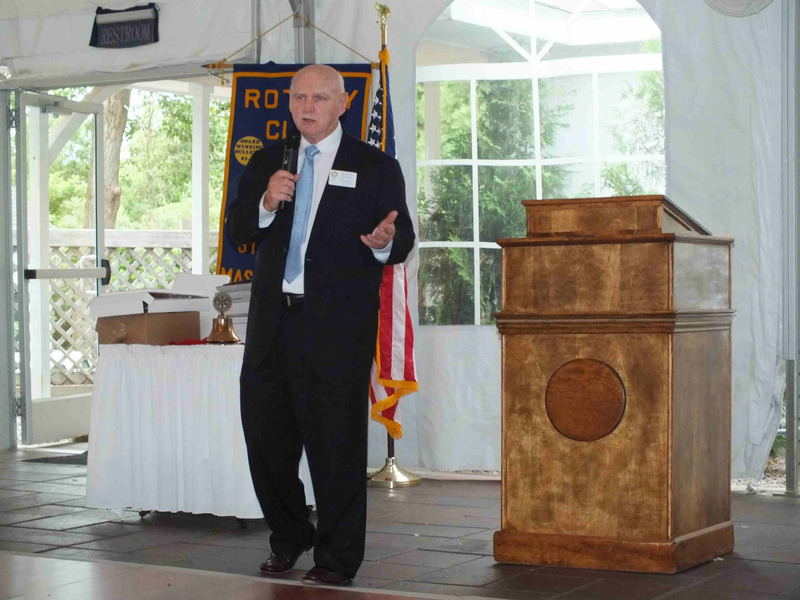 President Otto outlines his plan for 2016-2017. 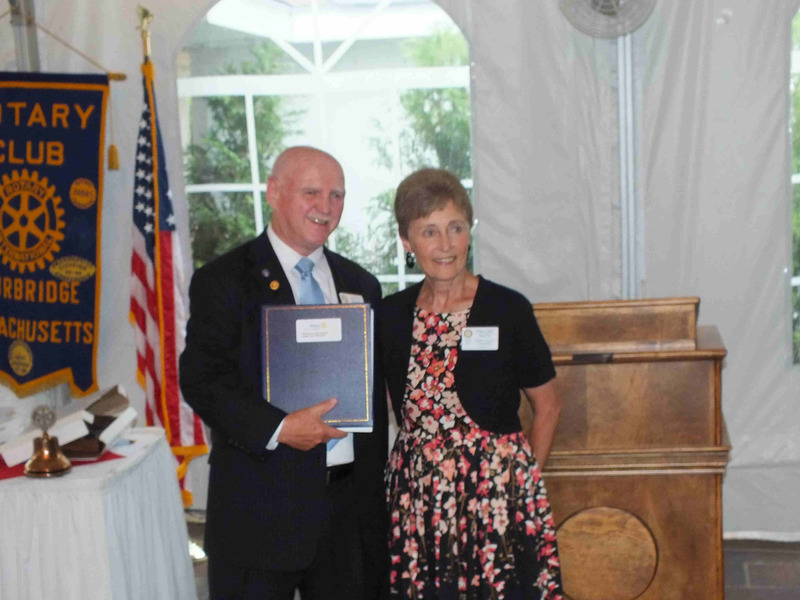 The culmination of a wonderful evening! 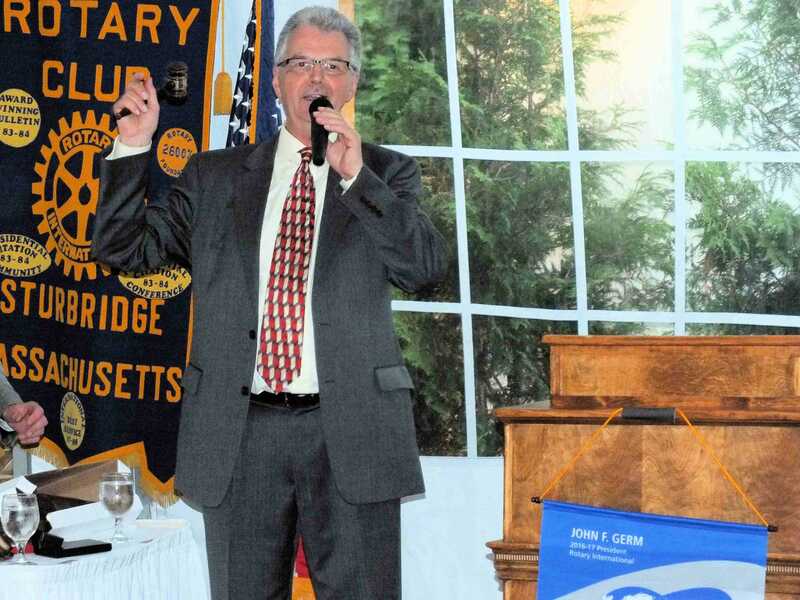 Tony Yeulenski presented a very interesting program about Life Skills, Inc., a non-profit organization that provides a wide variety of services to individuals with intellectual, physical and emotional disabilities. 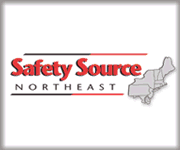 Located in Webster, MA, the program continues to grow serving MA and CT. Besides the quality programs offered to the disabled, Life Skills also has a Thrift Store, a Best Buds Greenhouse, a ceramics studio whereby the products made by the clients are sold, and a Take 2 Bakery. 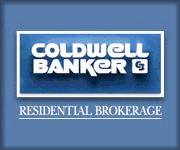 Great services offered locally. President Austin (right) presents a Rotary mug to Tony.